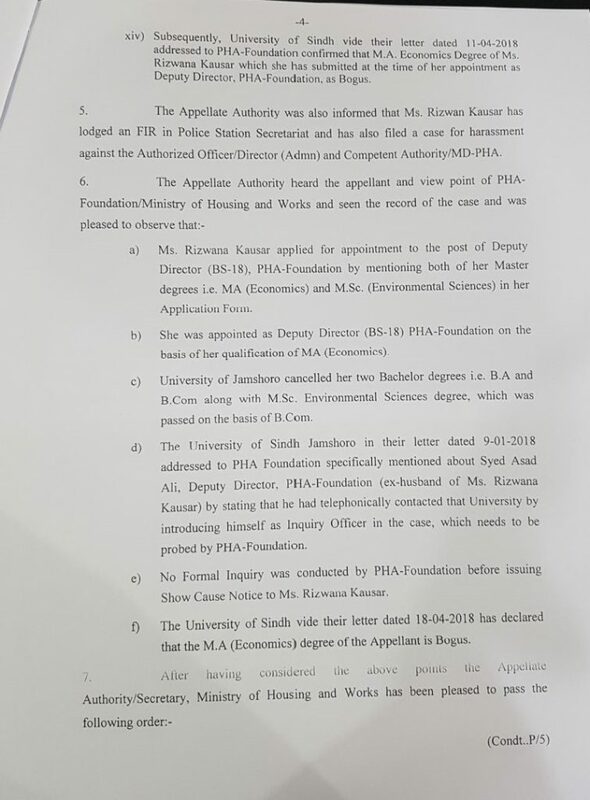 I have already discussed regarding current situation in Pakistan Housing Authority Foundation PHA(F) where Ms. Rizwana Kousar who was sacked from Job by the management due to defection of her degree on which she applied for the job as Deputy Director. 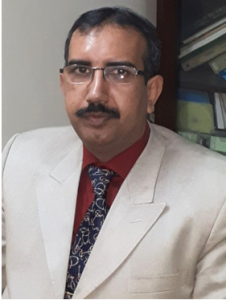 Few days ago before this scandal was exposed another news from Federal Investigation Agency FIA was being heard that a Deputy Director was being arrested because of his fake educational degree and now a days is facing a trial regarding the matter, whereas complete different scenario is being observed in PHA(F) where Deputy Director was sacked from the Job due to illegal degree but higher management and secretary of Ministry of Housing reinstated her back and called for proper inquiry I already covered all aspects of this case Ms. Rizwana Kousar after being sacked from Job registered an FIR against higher management of PHA(F) rather than registering FIR against Ms.Rizwana Kousar for illegally acquiring Government Job she is now again awarded job until another proper hearing. 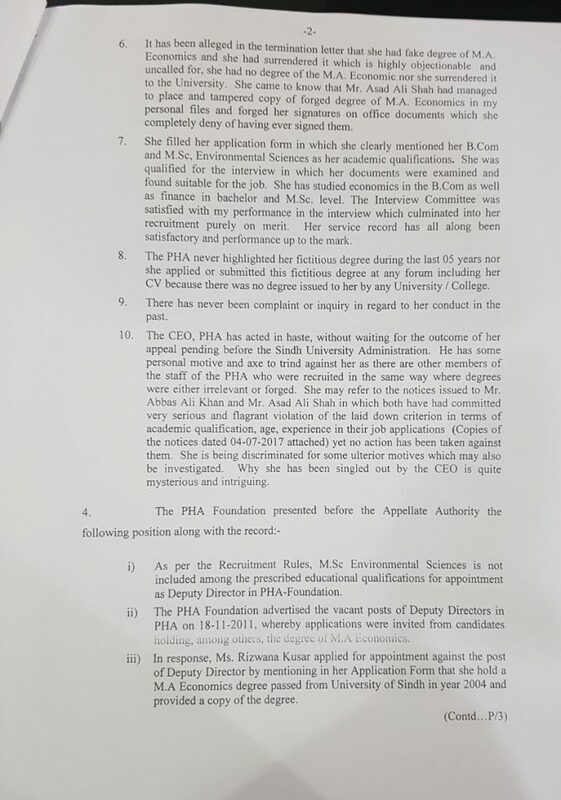 This issue was came to surface in year 2015 when PHA Foundation initiated the verification of the degrees of all of its employees including Ms.Rizwana Kousar, In this regard Ms.Rizwana Kousar on 16-11-2015 stated that she was selected through competitive process on the basis of her M.Sc in Environmental Sciences and she had surrendered her M.A degree. 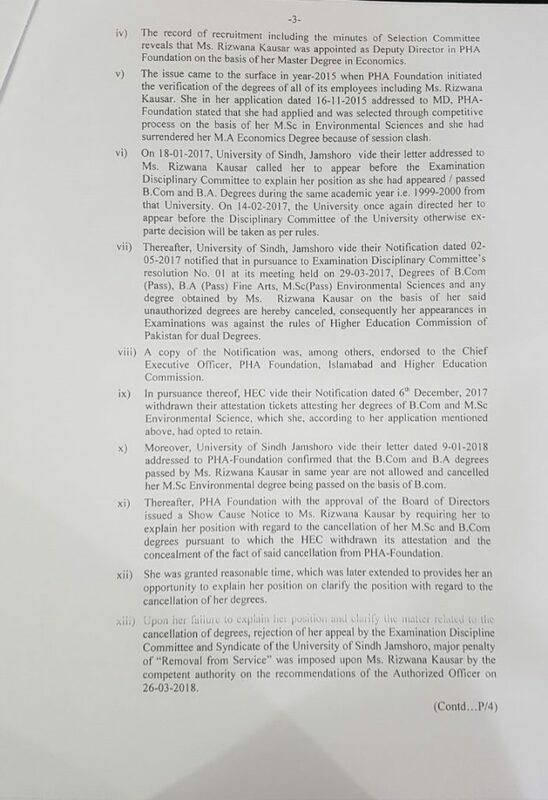 On 6th December 2017 HEC withdrew there attestation tickets of B.com and M.Sc degrees of Ms.Rizwana Kausar which she in her application opted to retain the Job. 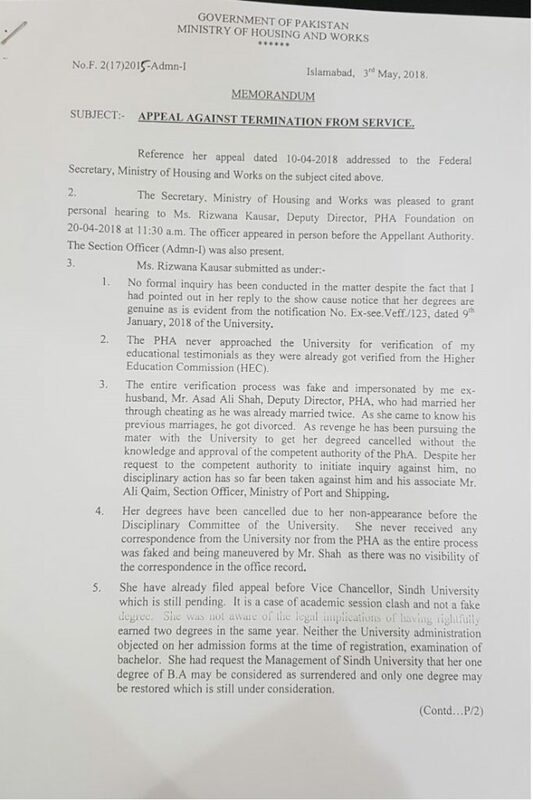 Thereafter, PHA(F) with the approval of board of Directors Ms.Rizwana Kausar was removed from service but in recent inquiry she was reinstated stating that without conducting formal inquiry establishing that her M.A economics degree on the basis of which she was appointed as Deputy Director PHA(F) needs to be confirmed. 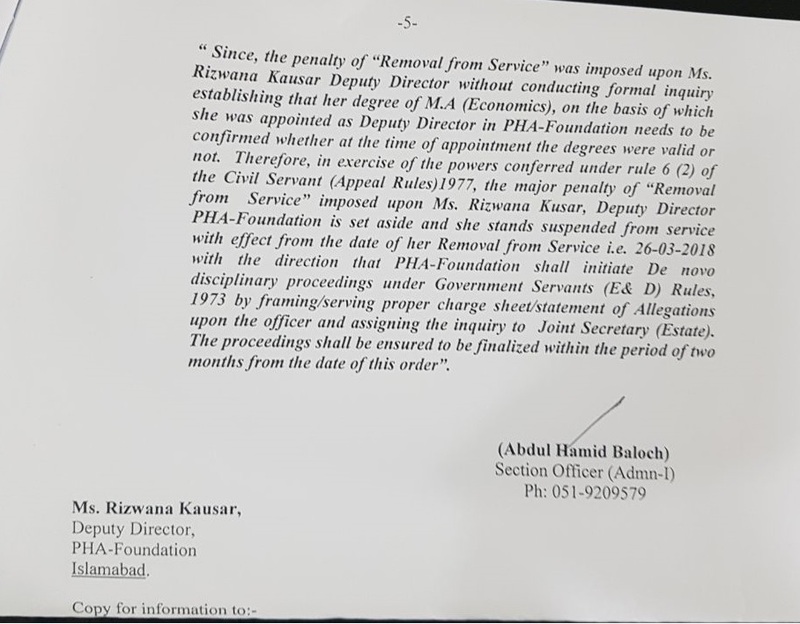 According to sources Ms.Rizwana Kausar has strong ties with the establishment & with section officer due to which she was given another chance to continue her Job whereas many qualified citizens are being denied to serve there country as they don”t have strong ties with the higher authorities there is immense pressure on higher authorities of PHA(F) that they should not hold proper inquiry against Ms.Rizwana Kousar, If people like her are allowed to work in Government sector then where as civilized nation we stand those who had sacked her legally are now being penalized and wrong doer is being rewarded what message does that carries ?other honest officials are also in trouble due to this particular mind set.